A traditional Prague hotel offers luxury accommodation in 79 guest rooms. All rooms are furnished with elegant dark wood furniture combined with cream-coloured upholstery. Superior rooms are equipped by individually controlled air conditioning, mini-bar, word desk, tea and coffee making facilities. 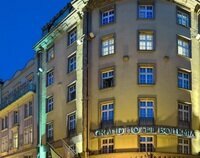 Grand Hotel Bohemia is located in the centre of Prague, in the very heart of the Old Town quarter of Prague. Old Town Square with historical Astronomical Clock, the Charles Bridge, Wenceslas Square or Jewish quarter Josefov – all this can be reached within a few minutes of walking. From metro station Náměstí Republiky situated 6-minute walk away from the hotel take a metro (line B) and go 6 stops to the metro station Vysočanská. Clarion CHP is located next to the metro station. The journey should take up to 15 minutes.